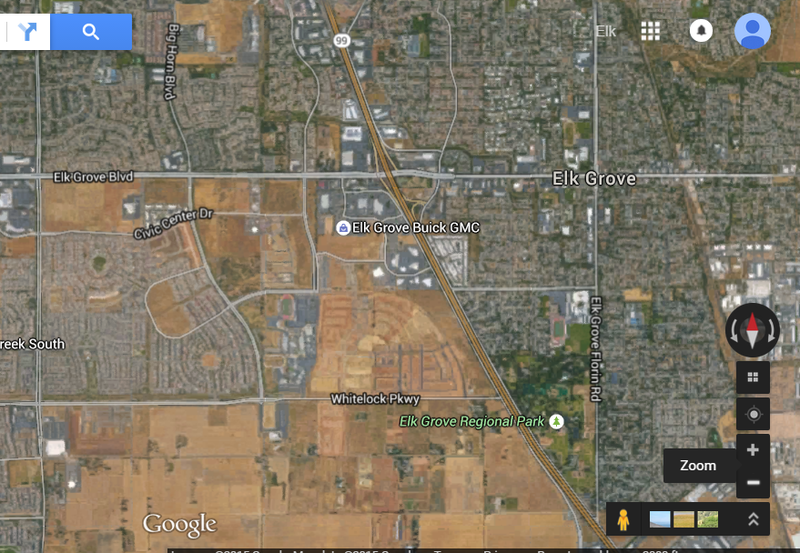 Why is The Elk Grove City Council Rushing The Souza Dairy Project? This Wednesday night the Elk Grove City Council will hold a special meeting to consider approval of the so-called Souza Dairy Project (SDP). The SDP is the first project in the city's Southeast Policy Area (SEPA). As the last large swath of undeveloped and unplanned in Elk Grove's current city limits, the SEPA has been billed as the cure-all to solving its worst-in-the-region and well-documented jobs to home imbalance. Mayor Gary Davis and Council Member Steve Ly made the promise of bringing high-quality non-fast-food-minimum wage jobs to Elk Grove the cornerstone of their successful campaigns last fall. As such, we would have expected the Mayor and his protege Ly would be laser focused on accomplishing that goal. Alas, all one has to do to see that Ly could care less about fulfilling that promise is to look at all the donations he rounded-up in his first full six months as a council member from residential real estate developers. Notwithstanding Davis and Ly's unsurprising broken campaign promises and their business-as-usual stances, the rush on approving the SDP is puzzling. Why the rush? First, the scheduling of the matter has been an on-again-off-again-on-again affair. With the Elk Grove City Council traditionally in recess for the first August meeting, the special session was scheduled, cancelled then once again rescheduled. Why the rush? Could it not wait until the second August meeting? Does getting this project approved at a breakneck speed have anything to do with the city's efforts to jump start the Outlet Collection shopping center at Elk Grove? Why else is the city making such extra-ordinary effort for an otherwise typical suburban cookie-cutter project when there is a substantial inventory of residential parcels? While we can't say why the five men of the Elk Grove City Council are in such a hurry to approve the SDP, there are plenty of existing lots in developed neighborhoods that can be built. Of course developers aren't interested in these as are less profitable and the actions of our council indicate their primary interests are the interests of developers. 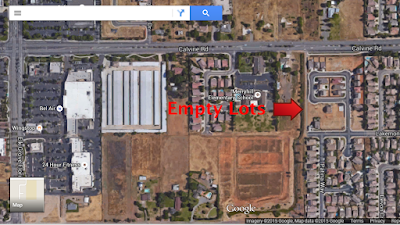 On the point regarding empty lots in existing subdivisions, consider some of the inventory below. Let's not forget, what's good for developers is good for the council members campaign funds. Conversely, we can predict with a high degree of certainly that the council will probably reject the planning commission and staff recommendations and grant the developer of SDP exactly what they want. Even though the council has the power to make Elk Grove a great bedroom community - that is what we are and will always realistically be - they will continue to be developer lapdogs and play to the lowest common denominator. As for the council's developing Mello Roos problem - pun intended - that will be worth watching. Laguna Ridge, aka Elk Grove's "Crown Jewel"
Even though construction has resumed in Laguna Ride following the housing collapse of The Great Recession that smacked Elk Grove, the are still plenty of empty lots available. Why not build this area out before another 1,100 home in the SDP project are approved? 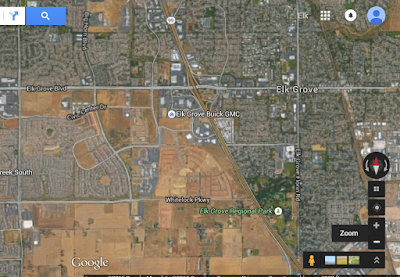 Above are two examples of older subdivisions, i.e., approved to Elk Grove's 2000 incorporation. There are a few dozen empty lots in these two older neighborhoods. Why are we as a city pushing south creating more sprawl while there are neighborhoods with empty parcels? Would not completed subdivisions help build greater home values and equity for the homeowners and in turn build stronger, safer neighborhoods. Are these neighborhoods and the homeowners being forsaken? rezone to residential or multi-family non-market rate rental units. Finally, we would be remiss if we did not address an empty 20-acre commercial parcel on Sheldon Road. 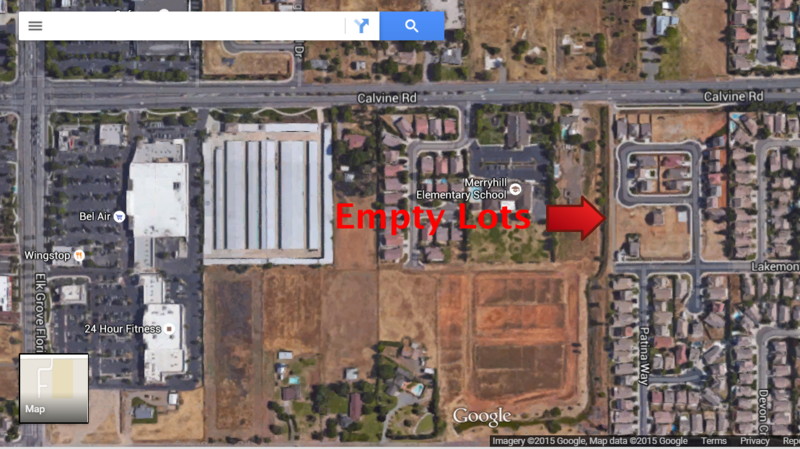 Given the abundance of empty commercial space in Elk Grove - think of the empty parcel on the southeast corner of Bruceville Road and Elk Grove Boulevard and of course the Outlet Collection at Elk Grove - perhaps there is a more appropriate use for this parcel. After all, the city council never met a rezone they didn't like. Would Council Member Steve Detrick be willing to rezone this parcel to high density multi-family housing to compensate for the nearby rezone from multi-family to commercial? The need for low income housing exist in Elk Grove and this location is within walking distance of schools of all levels, shopping, bus lines and fast food outlets. Remember, it was Detrick who happily took the lead and threw Koto Drive homeowners under the bus so his good "friend" Gil Moore could rezone that 5-acre parcel from multi-family housing to commercial. As Moore's surrogate, Detrick was the catalyst that resulted in Koto Drive homeowners having the dubious distinction of being only ones in Elk Grove whose homes directly back up to a fast food outlet and a gas station. As Mayor Davis would say, making stronger neighborhoods! Developer wins, council members get cash, and oh well, the homeowners lose - but hey, two out of three ain't bad! We would hope Council Member Detrick would be willing to subject his home and hearth to the same conditions that he imposed on the hard-working families on Koto Drive. After all, that is what integrity and character are all about. The city is creating a patchwork effect much like an unfinished jigsaw puzzle. They leapfrog from one piece of land to another before a city can naturally grow into the area. So basically, we have all these...for lack of a better word, little cities that get trapped and unable to grow like they typically should. Our council has allowed developers to have a gun to their heads by accepting all those contributions. They sold our souls to the highest bidder. Why is The Elk Grove City Council Rushing The Souza Dairy Project...the Developers OWN them! Can developers make it rain too? Elk Grove is well on its way to becoming a big steaming dumpster fire of a suburban ghetto. Bunch of cheap houses, strip malls, fast food joints, etc. Laser focused on turning this city into the South Sacramento of the 2020's. Ah..... the lovely sound of sirens, speeding cars and the ever present ghetto bird. Mr. Gougherty, interesting thought on WWMDD; What Would Mr. Detrick Do if confronted with plans for apartments near his house. Based on his pre-council activities, we already know how he feels about anything he considers substandard near his house. But it did get me to think of this possible alternative strategy Mr. Detrick used in his dealings with Mr. Moore. Fearing that the parcel Mr. Moore is now building his establishment on was actually zoned for apartments, perhaps Mr. Detrick, with the help of Mr. Gil Albiani, got Mr. Moore to buy it. All you need to do, Mr. Detrick told Mr. Moore, is throw some money around to me and my com-padres and we will give you anything you need ... and more. Now that Mr. Detrick has dispatched those apartments from his neighborhood, his next objective is the other big parcel on the corner of Sheldon and Power Inn. I seem to recall that one of his city council colleagues said we need more lakes in Elk Grove. Now if Mr. Detrick can just convince Mr. Moore or some other person he can shakedown for some cold hard cash to build a gated community complete with a water ski lake, his work would be done! "We need more rooftops to attract jobs." "We are laser focused on jobs"
Yeah and I believe in Santa Claus and the Easter Bunny too. Aren't 160,000 residents enough to attract at least one large private sector employer? ​Read what Black Woman Blogging (an African American female attorney) had to say about Elk Grove and why she found it necessary to move to western Placer County (Roseville / Rocklin). Elk Grove was too ghetto for her. Elk Grove was touted as one of the fastest growing cities during the housing boom. Here’s why: San Francisco Bay Area homes have always been more expensive than Sacramento area homes on average, no matter where those Bay Area homes were located. Elk Grove, a formerly sleepy bedroom suburb and, before that, a dairy farming community, was undergoing a construction boom. The newly constructed houses built in Elk Grove in the run-up to the housing bubble were initially priced for the lower-priced Sacramento market, not the Bay Area market. Folks in the ghetto in the Bay Area were able to sell their homes and buy one, and sometimes two, new homes in Elk Grove. Some of them lived in the homes, some rented them out. And many of them brought the ghetto with them. As the boom roared on, even folks in the ghetto in South Sacramento, with the assistance of shady lenders and real estate agents, were able to buy newly constructed homes costing ten times or more than annual salaries. BMNB and I didn’t know this when we rented a newly constructed home in Elk Grove in 2005 and again in 2007. We were foolish enough to believe that new construction could not equal ghetto. All of these things happened to us or near us in Elk Grove. For the life of me I could not understand why folks would move to the suburbs only to bring the ghetto with them. .
One area where the greedy developers threw up sticks and stucco as fast as they could before the last housing crash of 2008. "Certainly not a ghetto in the historical sense of the word, but we have our issues. The corridor bounded by Franklin on the west and Big Horn on the east, Sheldon on the north and Bilby on the south is one of the least desirable areas of the city. Too many apartments. Too much crime. You couldn't pay me to live in that area. We lived there for 10 years, but a little east of Big Horn, which was better, but we saw the signs and knew it was time to head east of 99. It's too bad but Bruceville and Franklin Blvd, not to mention I-5 are easy access from the south Sac area. East of 99 isn't as bad, even in South Sac. " We have a bunch of crooks as city leaders. They sold our souls to the highest bidders to enrich themselves. And what they couldn't sell, they destroyed. These crooks are spiteful, particularly Mayor Davis. Maybe the whole city council should visit Pakistan, our potential sister city. It's probably the cheapest way to find new replacements.